Luckily for UK gardeners who fancy going for a tropical look, steamy tropical weather is not required to achieve it. Dramatic and contrasting foliage is the key to creating an exotic look with a long season of interest and there are both sun and shade loving plants that fit the bill. Here are a few of both. Nothing does the hot tropical look better than Cannas, but despite their steamy looks they can be grown easily in any area of the UK provided they are given winter protection. Most Cannas grow to an average of 1.5m tall and have striking, architectural leaves and fiery flowers in hot reds, oranges, yellows and pinks. Cannas are extremely versatile plants and have a lot to recommend them in addition to their good looks, not least the fact that despite their height they are sturdy enough not to require any staking. They also have a long flowering period, from late June to October, are happy on any soil as long as they get plenty of feed and will tolerate drought conditions as well as being happy in standing water. 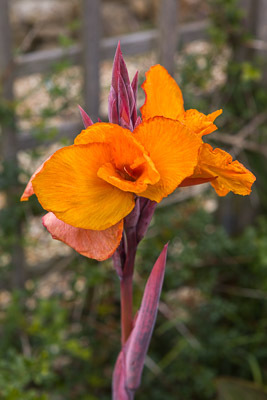 Finally, Cannas will flourish in both sun and shade, but for best leaf and flower colour they should be grown in partial to full shade to prevent fading. There is a wide range of Cannas to choose from with leaf colours varying from plain green or deep red/purple through a range of striped colour combinations. All are equally happy in the border or patio planters. 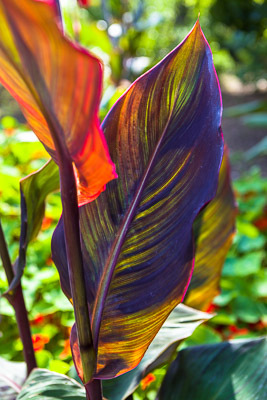 Canna ‘Durban’ [also now known as ‘Phasion’] is very popular owing to the dazzling effect created by its leaves which are variously striped in green, purple, orange and pink and topped by bright orange flowers. I love it! Growing tips: Cannas require minimal attention during the growing season, but they do need winter protection. Lift the rhizomes as soon as the first frosts blacken the leaves, pot up and keep just slightly moist in a frost free shed or greenhouse. Never deadhead Cannas as new flower shoots emerge from the dead flower heads. Curious fact: Cannas were originally grown in the Americas for food and the starchy rhizomes are still eaten in some parts of Bolivia and Colombia. Miscanthus sinensis ‘Strictus’ is a tall, elegant, grass which is very similar to the more widely known Miscanthus ‘Zebrinus’ (aka ‘Zebra Grass’), only this variety is more upright and harder to find! Like Zebrinus, it has unusual creamy yellow bands on its leaves making it a really striking plant to grow [NB: these bands are temperature dependent and usually only appear after mid-summer]. Silky panicles of pale pink flowers appear in August to September turning to silvery seed heads that last well through winter. Miscanthus Strictus grows up to 2m+ in height, making an excellent specimen plant and also looking very dramatic grown in groups towards the back of the border. 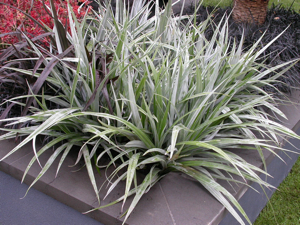 The pale stripes can suffer from scorch if grown in full sun so this grass is best grown in light shade where it makes a perfect backdrop for Cannas. 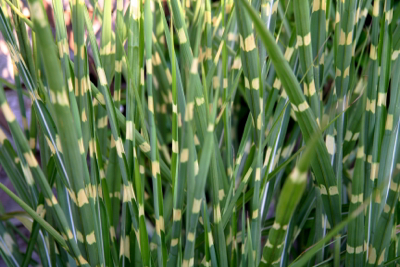 Growing tips: This is a fully hardy deciduous grass and should be cut back to the ground in late winter before new growth appears. Fatsia Japonica is an oldie but goodie, and this hardy, handsome, tropical looking evergreen shrub continues to enjoy well-deserved popularity. The huge, glossy, palmate leaves provide instant architectural interest and contrast in any aspect from full sun to deep shade while in autumn exotic looking panicles of creamy white, spherical flowers are produced, often followed by round black fruits. Other varieties of Fatsia include Fatsia japonica ‘Variegata’ (no surprises for guessing it has variegated leaves!) and a newer very attractive variety called Fatsia japonica ‘Spider’s Web’ which has unusual speckled white markings on the leaves. 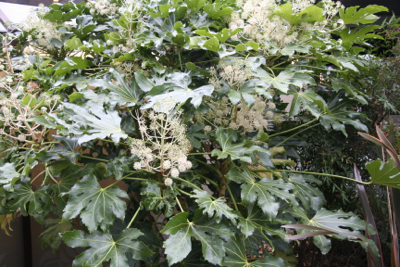 Garden tips: Frost hardy and extremely easy to care for, Fatsia Japonica requires little or no pruning or attention of any kind once established. Its only requirement is adequate space as it has a potential height and spread of 4m, although it can be kept happily to about half of this with regular pruning. 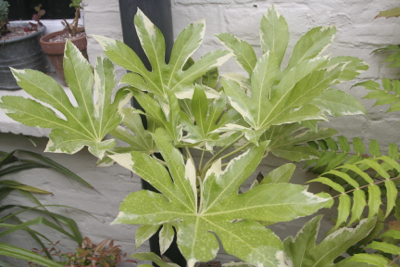 Another plant grown as much for its foliage as its flowers is Euphorbia Mellifera – the bright green leaves with their central white stripe contrast brilliantly with those of Fatsia Japonica. This magnificent Euphorbia has a naturally domed form (up to 2m high & wide) and makes a strikingly tropical statement in the border in full sun or partial shade. 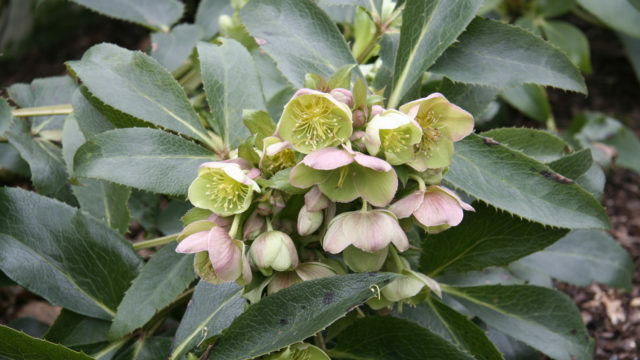 The leaves are arranged in whorls around stiff stems that produce bronze tinted, honey scented flowers at their tips in spring (hence its common name of ‘honey spurge’). 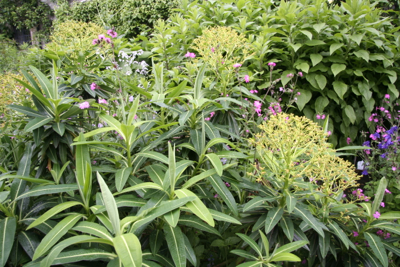 Garden tips: Euphorbia Mellifera prefers a well-drained soil, will thrive best in a fairly sunny, sheltered spot and may require winter protection in colder areas. Cut back faded flower stems in autumn. 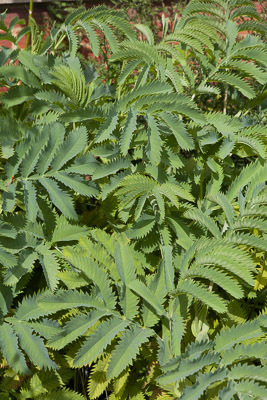 Melianthus major is a plant with quite stunningly beautiful foliage that make it a really wonderful specimen plant for a sunny tropical planting. The leaves emerge quite late in the spring, but are well worth waiting for: up to 50cm long, they are a lovely soft glaucous grey/green in colour with stunningly crisp serrations at the edges. In hot summers curious bronze red tubular flowers may appear between May and July, but it’s really the foliage that’s the star turn. After the spring growth there’s a bit of a lull until late summer when the plant puts on another spurt and can reach a height of 1.5-2m. Growing tips: Prefers a sunny aspect on reasonably fertile, well-drained soil and a good mulch of organic material such as well-rotted manure in spring . Although it is a shrub, treat Melianthus major as a perennial for best results, cutting the stems back to two or three buds in spring to prevent it getting leggy. It is not fully frost hardy and requires protection from frost with a dry straw or bracken mulch in late autumn. If it does get knocked back by frost, don’t panic! Chances are it will reappear in spring if the winter isn’t too harsh.